Yesterday (Wednesday, May 11th), Ireland defended its human rights record during a public hearing before the Human Rights Council as part of its second Universal Periodic Review (UPR). The UPR is a unique process involving a review of the human rights records of all UN member states. It is the first human rights mechanism to address all countries and all states. 20 countries held Ireland to account for its failure to take meaningful steps to bring its abortion laws in line with international human rights standards and norms. Denmark expressed concern at the false distinction the Protection of Life During pregnancy Act 2013 makes between health and life. Denmark called for Ireland “To Repeal Article 40.3.3 of the constitution and decriminalise abortion” by allowing the democratic process to unfold. India recommended that Ireland “bring abortion legislation in line with international Human Rights Standards”. This call was echoed by a host of other states including the Netherlands, Uruguay and Iceland. The United States expressed its concern at “negative developments in women’s reproductive health, including the imposition of criminal penalties on women who procure an abortion and those who assist them in procuring an abortion.” Cuba echoed this statement by expressing its own concern at the Protection of Life During Pregnancy Act, in particular, its restrictive implementation. 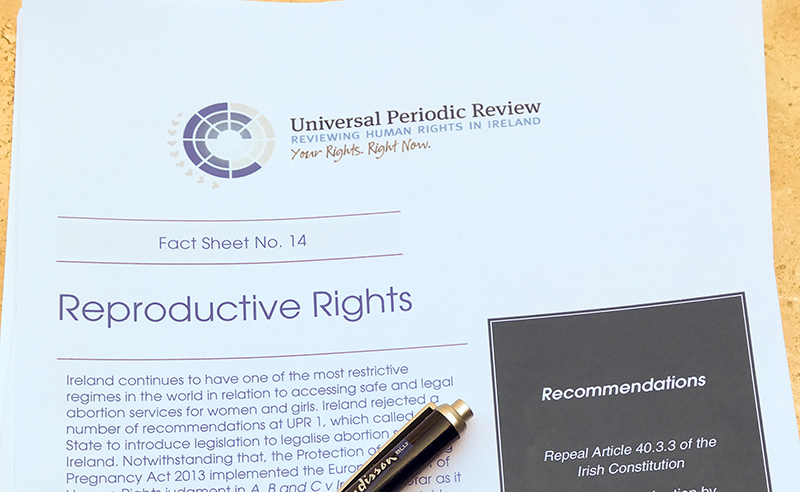 In its submission to the UPR process, the Abortion Rights Campaign drew attention to the shortcomings of Irish abortion law, arguing that the Protection of Life During Pregnancy Act 2013 does not fulfil Ireland’s obligations under the European Convention on Human Rights, nor does it legislate for the constitutional right to abortion established in the X Case. The submission also criticised the State’s decision to re-criminalise abortion under the Act, highlighting that this was a dangerous and unnecessary step, which contravenes human rights standards.